There have been some decent wahoo swimming around in our waters so Maureen wanted to try and target wahoo on 8# test and needed a 55# wahoo to get the Women’s record. We pulled 5 lines all day with all wire. We started in the SW corner of the Wilmington and the first two hours of daylight the tunas were biting pretty good. I thought we would get lucky and get a bit eon wire but it never panned out. We worked a good 5 degree temperature break (74-79 degrees) here on the 100 fathom line but no bites for us other then skipjack tunas. With this double overnighter planned on Exile 65 with so-so fishing, we had to do what I love doing the most… Catch What’s There!!! The weather was iffy with winds out of the dreaded NE at 15-25 the entire trip it was going to make fishing tricky. We made the run out and started fishing Wednesday in the Wilmington Canyon at 1pm. There have been some marlin roaming around so we started off targeting white marlin with the dredges and teasers out. We managed to go 2/4 on white marlin in the light rain and fog and caught 2 mahi in the mix. 3/4 white marlin ate the DownSea Blue Party Hat on a small ballyhoo and the 4th bite was switched off of the teaser to a naked ballyhoo. Around 4:30pm we made the switch to wahoo fishing the West Wall of the canyon and had all wire out. The temperature break from 74-79 degrees was around the West Notch so we worked there down to the corner. No action until around 6 pm we had the center rigger black and red Ilander/ballyhoo get slammed! We assumed it was a wahoo until the fight was prolonged and it turned into a nice 70# yellowfin tuna. Awesome fish. We setup in the SW Corner of the canyon along the true 100 fathom line with a southerly drift and had a sword bite right away that didn’t get the hook. We tangled with quite a few nice sized tiger sharks and hammerheads the first half of the evening and had 2 other sword bites. We rest 3 times this night and the second half of the night was slow until around 3 am the right one ate the sword bait down deep with a bonita strip covered with a green/white Tuna Flare. Game on. Billy fought this fish for 50 minutes in a give and take battle. We chased the fish around for miles and then the fish shook its head hard and chaffed himself off of the 300# leader. Major bummer, only 50 feet from the leader. Thursday morning the conditions just weren’t looking great in the Wilmington so we started our wahoo troll south along the temperature break to the Baltimore. We had a wahoo swing and miss right away and then 2 more wahoo bites along the way that we ended up pulling hooks on. Tough tough luck. We made it to the tip of the Baltimore mid day and released a white marlin then pot hopped for mahi for awhile and got into some pretty good action with that catching around 20. We got back on the troll for wahoo and had another come tight then pull the hook in the NE corner of the Baltimore Canyon. It was starting to get late so we pushed into the center of the canyon in the 500 fathom bight and there were about 20 pilot whales very active and close to 200 birds working the area hard so we switched to the tuna spread. I marked a ton of bait but no fish at all. After working the area hard we finally got our bite on the right long DownSea Blue Tuna Flare and game on. Chris did well and brought the 70# yellowfin to the gaff shot where Cullen finished the job! We setup here for the night and the first drift was unproductive other then catching some mackerels. It was a long and slow night until about 3am as I was bringing up the sword baits to get ready to move and reset that the shark rod started to click out (yes, like JAWS). I came tight on the fish and it wasn’t doing much. We got settled into the fight and after about 5 minutes the fish finally got real and started stripping line. 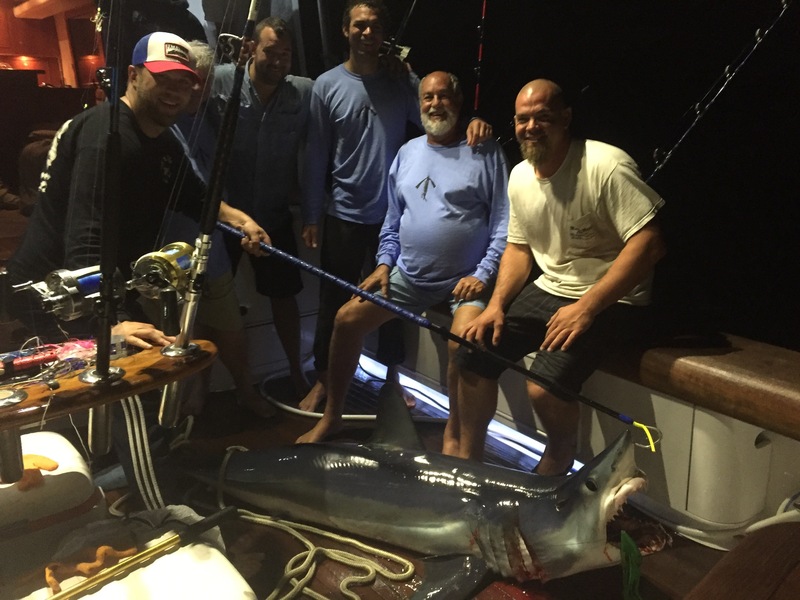 After about a 45 minute fight we got the nice Mako close enough for Cullen to finish the mako off and that fish made the night! Ended up weighing 181 lbs! We gave the wahoo troll another last chance effort for a couple hours in the morning and had one on right away to only again pull the hook! Ouch. We did release one more white marlin and called it a trip. AWESOME TRIP!!! Today I mated for Captain Joe Trainor on the 48′ Ocean Justified. The plan was to target wahoos and it was game on. We got to the break just inside the Wilmington canyon and had a triple header wahoo off the bat. All good fish 35-50 lbs. not long after we got a single wahoo that went upper fifties. We trolled around some more and had two White Marlin bites that didn’t come tight then WHAM! Double header wahoos. Nice ones with the biggest weighing in at 66 lbs. we went on to catch some small mahi and 1 White Marlin out of the 4 total White bites we had. Great day of fishing! Well with the epic Marlin action we have been seeing here in our canyons, it’s has been driving me crazy hearing all the awesome reports and not being able to get in on the action, BUT Exile 65 is rigged and ready and we went for it today. While we didn’t get to see the numbers as today overall was a slower day, we still had great fishing by any means. We started our day in the NE corner of the Baltimore and early on had a white Marlin pile on the right long ballyhoo with a DownSea Blue Party Hat, but no connection. The bite was very slow and the fleet was plenty big given the fact the bite here yesterday was great. By 930 with no real action we picked up and ran to the Wilmington where we knew there were some fish yesterday and we needed to find something new. 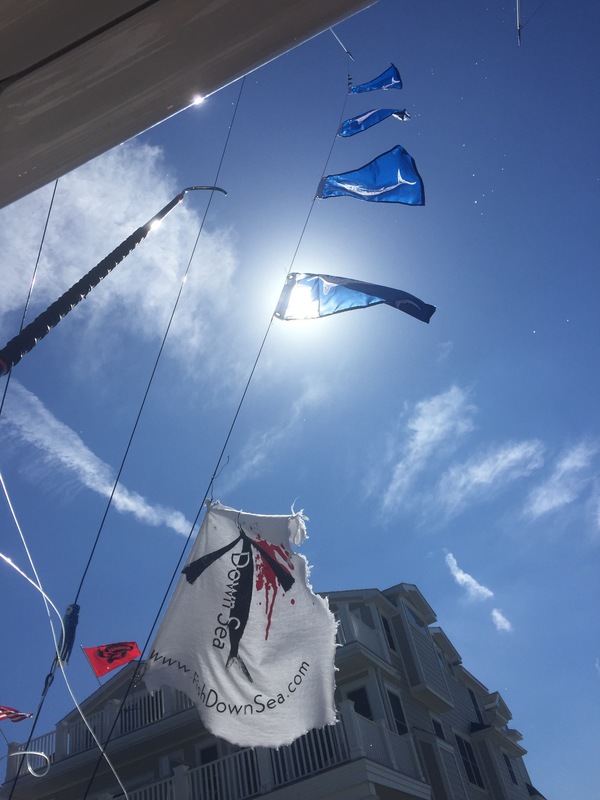 310 saw two more white Marlin trailing long but no bites. Ended the day 3/6 on White Marlin and 1/2 on Blue Marlin. Fun and great first day on Exile 65..! I am happy to announce that I am going to be running charters aboard the Exile 65 (CLICK HERE to See the BOAT) which is a beautiful 65′ Paul Mann Custom Sportfishing Boat. This vessel is a fishing machine with all the creature comforts you could want whether you are fishing a day trip to the Canyons off of the New Jersey Coast or fishing on a liveaboard trip in the Bahamas. ISLA MUJERES, MEXICO January-February targeting Sailfish – double digit days of sailfish are very common in Isla Mujeres and the little island is full of flavor! 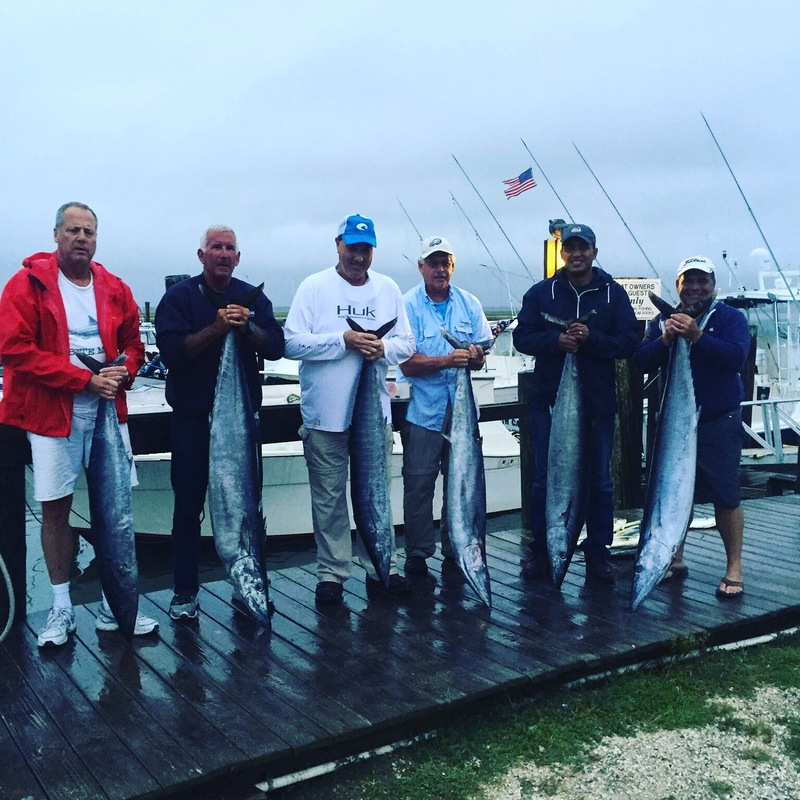 THE BAHAMAS March-May targeting wahoo in March and Marlin, Sailfish, and Dolphin April-May. Liveaboard trips offer even more. 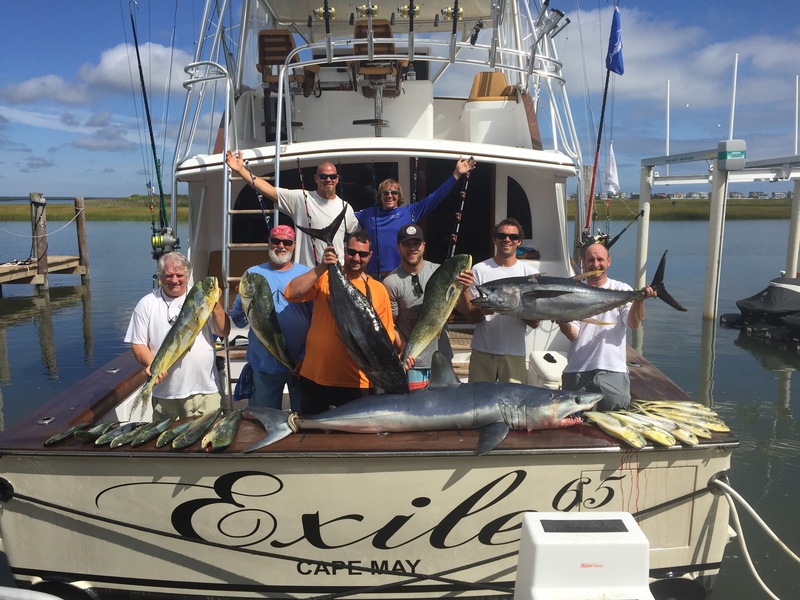 I have been very busy getting the boat all rigged and ready since the Mid Atlantic which between that and the windy weather has kept me off the water, but we are set and ready to go fishing now so BOOK A TRIP with us on Exile 65. CONTACT ME with any questions or to book a trip. The past 6 weeks have been wild and crazy between the major fishing tournaments and now the new boat I’ll be running, Exile 65, and getting that rig ready to go. Herman has had us laid up all weekend and I am getting caught up prepping the Exile so I finally had some time to start working on videos. I have a lot more footage to edit, BUT I did manage to get this one finished and it’s called Bigeye Battles, so check out this trip from back in early July and watch in HD!! !